How Do You Get Kids to Listen? Listening skills can be practiced in fun ways in the home. 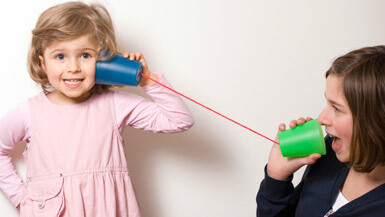 Since kids learn through play, here are fun ways to teach your charges to listen better. Play a story game with the child or with the whole family. The Babycenter web site suggests that one person begins a story with the sentence of his choice, and the next person adds a sentence that continues that thought. You can set a limit ahead of time for how long the story should last — for example, five-minutes or 10 sentences. The game helps develop listening skills because children must concentrate on someone else’s words so they can form a logical sequel. DISNEY FAMILY FUN recommends engaging children in a verbal scavenger hunt to help kids learn to have good listening skills. Have children listen as you say a list of three or four items they need to find in a room. Never repeat the list. Send them to find the items. As they become more successful listeners you can increase the number of items on the list, suggests DISNEY FAMILY FUN . Univeral Preschool recommends making two identical musical instruments out of recycled products — one for you, and one for each child. Then, make one, simple noise with your instrument and ask the kids to try to imitate it with their instrument. Then, make two noises, then three, and have the children in your care attempt to repeat the patterns you create. Let the kids make up a sound pattern so that you can repeat what they do. Variation: Sing or hum a portion of a song or tune, and ask the children to repeat it. When you read to the kids, turn it into a listening game, suggests SchoolFamily. Before you start reading, tell them you are going to zip their lips so they can listen but not talk. When they want to say something or ask a question, they can give you a signal to unzip their lips. When they read aloud to you, reverse roles and let the kids zip your lips. Read aloud to kids to encourage active listening. Baby Center suggests pausing during the last few pages of a book and ask the kids how they think the story will end. Discuss their theories and how they relate to what they heard of the story so far. This will encourage the children to listen closely and reflect upon what they have heard. Another strategy is to take out an old, familiar storybook and change a few key elements of the story while reading it to the kids. This is a fun way of testing how well those in your care are listening. Kids usually enjoy correcting “silly” adult errors. Play games that include giving directions. Simon Says is a popular one in which kids have to listen to the directions — and to whether you precede it with the words “Simon Says.” SchoolFamily recommends another listening game that starts with a two-direction command. Tell the kids to walk to the couch and run back to their chairs. When they master two-step directions, add more. For example, tell the kids to pick up a pencil, write their names, and draw a circle around it. Develop a star chart to reinforce good listening skills. Reinforcing children’s listening skills will help increase their occurrence. Include specific listening skills on the chart. When they engage that skill, they will earn a star. Allow the children to add stars to the chart themselves and always tell them what they did to earn the stars. Provide a larger reward to kids once they obtains a specific amount of stars. How Many Times Do I Need to Tell You? My idea is simply to gather some index cards. Tell the children in your care that you are going to play a game to see if they can listen and follow directions. Whenever you give them a direction, count how many times it takes the kids to do the task, and write that number on an index card. For example, if you ask them to: “Put your homework in your backpack,” or, “brush your teeth and hair,” record how many times it takes to remind them until he actually accomplishes the task.